“Kambakht Ishq” kabhi hasaye to kabhi rulaye! Poor Saif Ali is in the same situation now, always keeping an eye and playing a dutiful boyfriend role for her gorgeous and size zero girl friend kareena kapoor is getting on his nerves. Things like, to be at IIFA Awards in Bangkok just to make Kareena happy and then to entertain her family members are too much. I think Kareena has proved to be very strong and demanding for Saif in their relation. Now the news is, on the sets of Kambakht Ishq where Kareena kissed Sylvester Stallone on the cheeks, didn’t go down well with Saif, who was present at the time of kissing scene shoot. I think Saif needs to grow up, he should remember they are in show business and that it was just a kiss on the cheek. And there are so many girls, including me will die to kiss Sylvester Stallone. 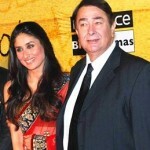 Let’s see how long Kareena and Saif relationship survive? I think Kareena is the most gorgeous actress in Bollywood. Not only good in acting, she is witty too. She has proved her witty nature by becoming Laila in the latest animated movie by Walt Disney and Yash Raj. She plays the role of Laila against Saif Ali Khan’s role of Romeo. kareena kapoor is getting better but look wise i feel she lacks grace completly and over acts most of the times , i liked her in jab we met though coz the role needed over acting . As for looks thank god she finally lost weight i used to find her so fat, her face is too big. she’s beautiful, no doubt and her acting has been improved, before that she had an overrated acting which I disliked, but now she improved.